Meredith came to us from the Birmingham Race Track where she raced 32 races without winning a single one of them. She did place second in a few. She turned two on February 11th so is a pretty young girl. She raced at 60lbs. Her sire is the very famous Kiowa Mon Manny and her dam is My Aunt Matilda. She passed her cat test and small dog test so should be fine to live with either. 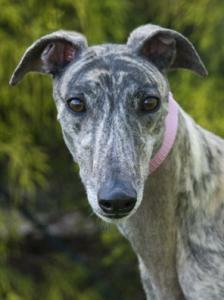 Meridith is a happy, friendly, girl that is a beautiful light fawn with brindle striping. She can be a little timid at first with men and can be a bit timid when out in new places, but that is likely to get better as she is exposed to more new things. She has gotten along fine with the other dog at her foster home. Meredith probably does need a fenced yard to potty in because she just walks on walks and doesn't stop to go potty even if another dog does.